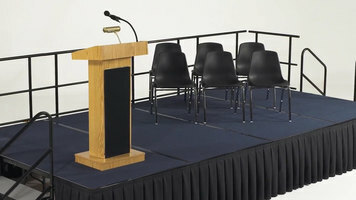 National Public Seating S368C Single Height Portable Stage with Blue Carpet - 36" x 96" x 8"
National Public Seating gives you the flexibility to build the platform you need for any performance. They come in multiple shapes, sizes, and heights, and are easy to set up. This video will show you the easy steps in building a stage for your next production. Begin by moving a stage panel into position. The special spring-locking mechanisms help lock the legs into place and prevent accidental collapsing. Temporarily move a side rail into place. Using the hole as a guide, score the carpet with a razor to avoid unraveling and use a 3/8 drill bit to drill through the stage base. Repeat the process for the remaining side rails. Flip the stage upside down and hammer in the T nuts to each previously drilled hole. Next, move the panels into position and lock them together by sliding one panel into the locking pins. After all stage panels have been locked into position, raise the side rails into place and tighten the bolts to fasten the rails to the stage. Repeat the process for the remaining side rails. To assemble the step, insert the hand rails into the base, insert the bolt, and tighten while using a second tool to hold the nut on the opposite side. Add the locking arms to the step and slide the step into place next to the stage. Raise the arms to the base of the stage and tighten the screw so the step remains tightly in place. Cut the provided cut and loop tape into smaller strips, remove the adhesive backing, and adhere them around the front and sides of the stage. Attach the skirt and the stage is ready for use in a wide range of venues as a full stage or seated risers. Need a full stage or set of seated risers for your venue? Try the National Public Seating stage! This step-by-step tutorial will walk you through the easy steps of assembly, guaranteeing you a reliable and sturdy unit. 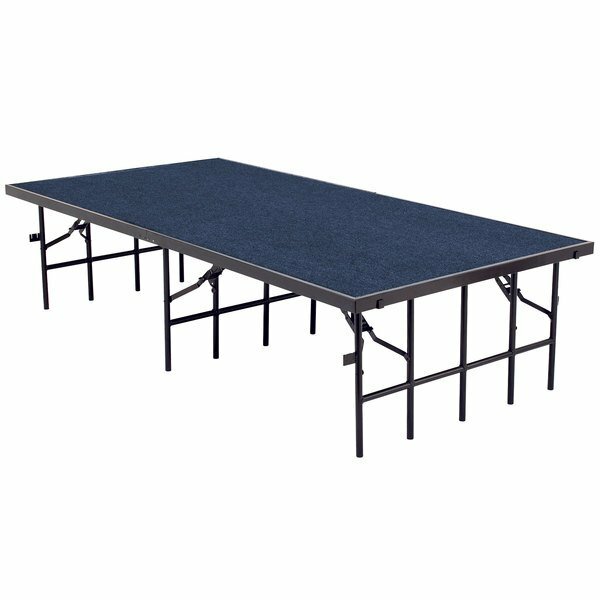 Bring your performance venue to the next level with this National Public Seating S368C single height portable stage with blue carpet! Built with a 16-gauge steel frame and a premium grade plywood core, this single-height is both durable and portable. For quick set up and safe use, its legs are made with 14-gauge tubular steel and outfitted with spring-loaded support brackets. Featuring blue carpeting and a black epoxy finish, this stage brings style to any occasion. For added convenience, it is outfitted with ganging to easily connect multiple stages. Its sturdy 7-ply plywood construction exceeds 200 lb. per square foot weight limits. In fact, National Public Seating stages are strong enough to hold an entire car! For added strength, the stage frame is reinforced with riveted steel plates attached at all points where frame parts join together. This product is certified by the Materials Analytical Services organization as having low volatile organic compound emissions. National Public Seating S3624C Single Height Portable Stage with Blue Carpet - 36" x 96" x 24"
National Public Seating S3632C Single Height Portable Stage with Blue Carpet - 36" x 96" x 32"